The Student Financial Aid Data Collection is a subset of the University Data Warehouse containing current and historic information about application for financial aid as well as aid awarded, from the Student Aid Management system (SAM). For a brief overview of the collection, see Student Financial Aid Data Collection Quick Reference. The tables in this collection are refreshed on a daily basis, Monday through Friday. The sources of the data is the mainframe Student Aid Management system (SAM). The Financial Aid data collection stores from fiscal year 2011 and on. The data loads began in early spring of 2011. The Business Objects Corporate Documents area provides access for authorized users to pre-defined, prompt-driven reports that you can run to retrieve a standardized perspective on your data. When refreshed there are no prompts. Lists all of the rows in the AidID Rules table, and includes the Rule Header text, the Rule Name, the range of AidIDs using the rule and associated terms. Use this query to learn about what is in the AidID Rules table. Uses Financial Aid universe. When refreshed there are no prompts. Lists a subset of Application and Biographic data for a sample group of students. Use this query to see examples of what is in the Application table and related Bio data. Uses Financial Aid universe. When refreshed there are no prompts. 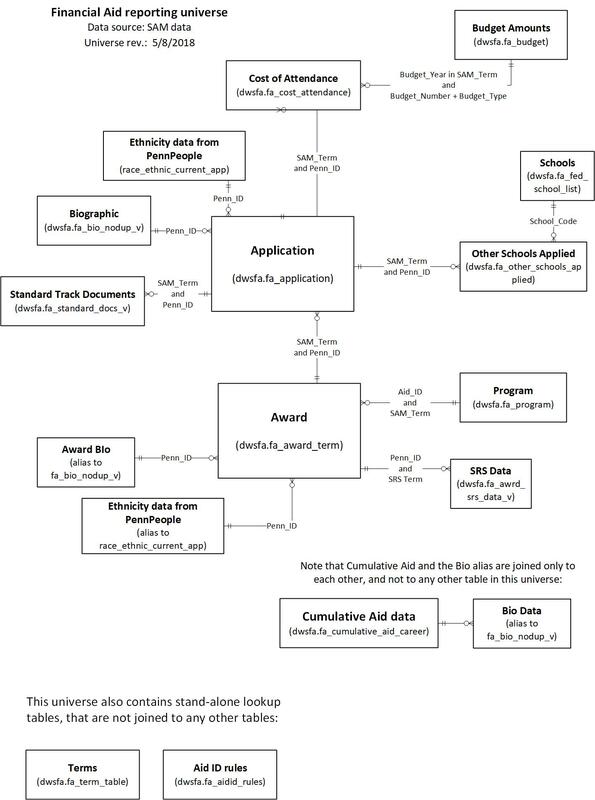 Lists a subset of Application and Award data for a sample group of students. Use this query to see examples of what is in the Application table and related Award Term data. Uses Financial Aid universe. When refreshed there are no prompts. Lists all of the columns in the Award Table for a sample group of students. Use this query to see examples of what is in this table. Uses Financial Aid universe. When refreshed there are no prompts. Lists all of the rows and all of the columns in the Budget table. Use this query to see everything in this table. Uses Financial Aid universe. When refreshed there are no prompts. Lists cost of attendance data for a sample group of students. Use this query to see examples of what is in the Cost Attendance table. Uses Financial Aid universe. When refreshed there are no prompts. Lists Cumulative Aid and related Biographic data for a sample group of students. Use this query to see examples of what is in the Cumulative Aid career table and related Bio data. Uses Financial Aid universe. When refreshed there are no prompts. Lists all of the rows and all of the columns in the Fed School List table. Use this query to see everything in this table. Uses Financial Aid universe. When refreshed there are no prompts. Lists all of the columns in the Other Schools Applied table for a sample group of students. Use this query to see examples of what is in this table. Uses Financial Aid universe. When refreshed there are no prompts. List all of the rows in the Program table, and includes the Program SAM term, Program AIdID, the Account name and description, and related aid information. Use this query to learn about what is in this table. Uses Financial Aid universe. When refreshed there are no prompts. Lists all of the columns in the Standard Track Documents table for a sample group of students. Use this query to see examples of what is in this table. Uses Financial Aid universe. When refreshed there are no prompts. Lists all of the rows and all of the columns in the Term table. Use this query to see everything in this table. Uses Financial Aid universe. There is no formal training for this data collection -- please contact the office of Student Registration and Financial Services with any questions about the use of student financial aid data. You can also refer to the table and element documentation for information and cautions about specific data. Contact Enterprise Information & Analytics for all other training questions. Complete the Financial Aid Data Access Request eForm and obtain supervisor, school access administrator and Student Financial Services (SFS) signatures. Access to this data in the warehouse will be given to users on a global basis, and will not be restricted by school or department. If a user has access to the tables they can see all information for all students in all schools. The only office that may release financial aid data is Student Financial Services (SFS). Requests for the data should be directed to SFS. Within the University, financial aid data may be disclosed only if it is needed to do the business of the University, and only to those who need to know the information in order to do their jobs. If you are not sure whether to fulfill a request for data, contact Student Financial Services. If you have a question or comment about the Financial Aid data and you already have access to this data collection, please write to the financial aid user group listserv. For comments about the data documentation, or this website, contact Enterprise Information & Analytics. If you are writing about a correction, please specify the URL for the documentation that needs to be updated.